Quirky retro scrabble chocolate chip cup cake and cookie ring attached to an adjustable silver plated ring. 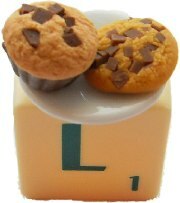 Miniature food and green letter tiles. * Not suitable for children under 14 years old.